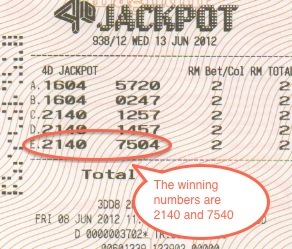 Yesterday the Jackpot 2 prize is RM140,250. We buy 2140 and 7504 on Magnum Jackpot game. It came out 2140 and 7540. Only the last 2 digit swapped. If not, we get almost S$56,120. Shared equally with 5 participants, that mean each can get more than $10K!